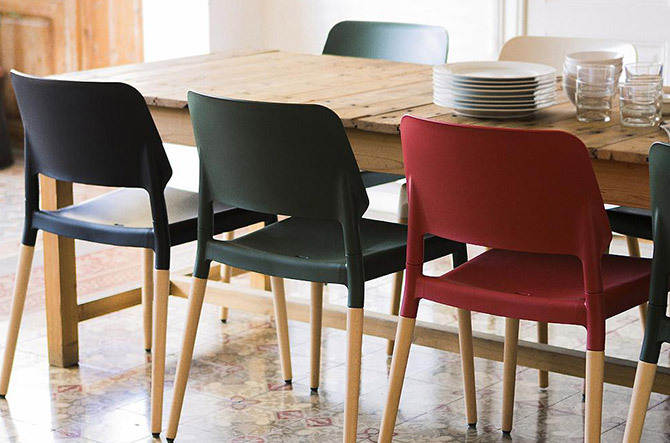 Choosing a new set of dining chairs can be a bit daunting. With near endless options out there, it can feel a bit like playing musical chairs and not being quite sure where you’ll land. For a stunning space you and your guests will love, we’ve let the music stop on our top 10 wow-worthy choices that are anything but traditional. This is Scandinavian design with a distinct shape. 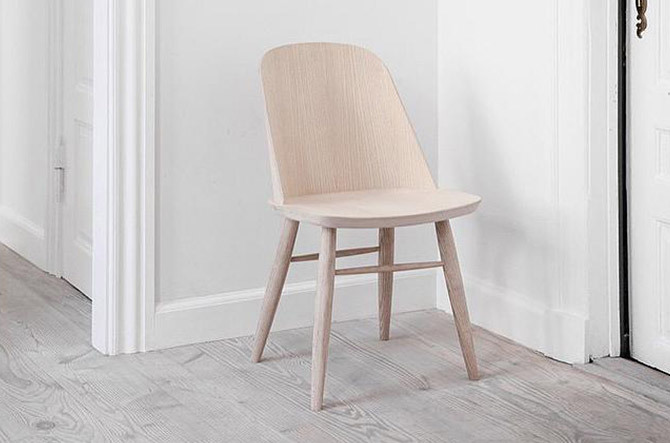 Designed by Falke Svatun for Menu, the curved back invites comfort and stability—we like to think of it as a little hug when you’re seated. The legs taper where they meet the seat as well as where they meet the floor, a detail that that creates stunning lines in a modern space. With a laser cut triangle in the seat, the Sloane Dining Chair from Marcelo Ligieri might look like it's smiling ear to ear—and a little joy never hurt a modern dining space. The leather wrapped seat is designed for practicality and comfort, while aesthetic details like the laser cut and contrasting frame add visual interest. Don’t be fooled by the name. This Italo Rota design is anything but modest, commanding the attention of all those at the table with a playful sophistication. From a distance, it has the appearance of draped fabric; but up close, you can see it’s made from a smooth and shiny polyethylene. It brings just the right amount of drama as captain’s chairs in the dining room (or even all the way around the table). Sit up to eat, and then lean back to relax—all without leaving the dining table. 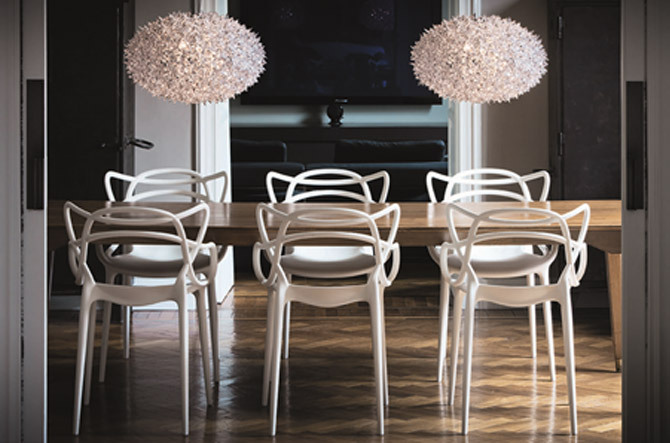 A creation from renowned designer Karim Rashid, Sloo is at once both a modern sculpture and a fully functional seat from which to share good food and conversation with your chosen companions. And because it’s made from ultra-durable polyethylene, it’s easy to transition from outdoor to indoor dining, depending on the season. 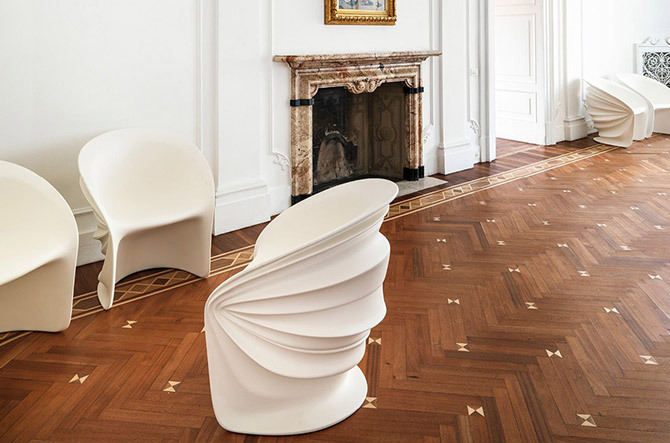 No modern chair list would be complete without mention of the Kartell Masters Chair. 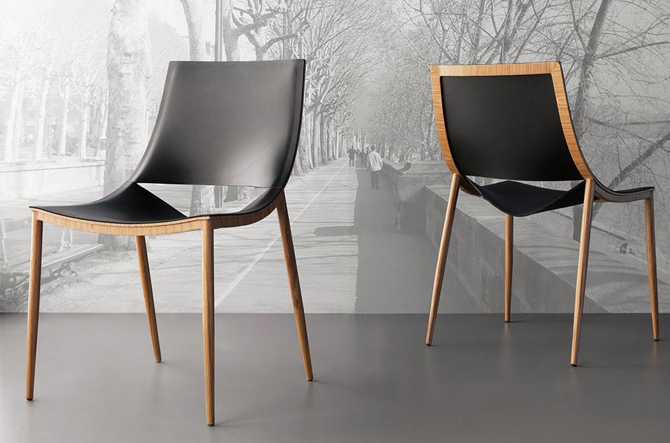 Honoring the past creations of design past—Arne Jacobsen’s Series 7 Chair, Eero Saarinen’s Tulip Armhair and Charles Eames’ Eiffel Chair—with a unique silhouette, this chair is lightweight, visually striking and comfortable to boot,. 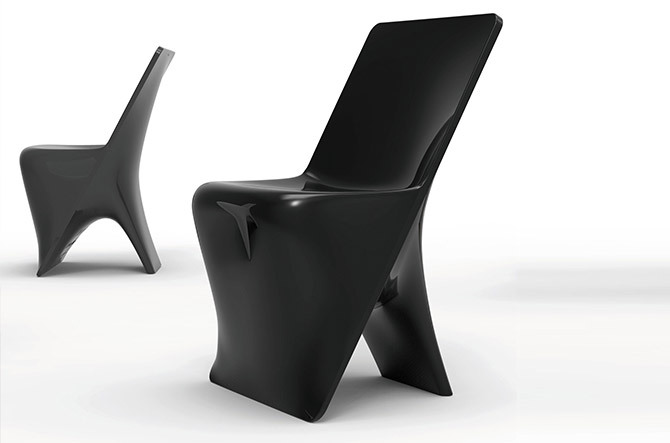 We’d say it earned its name in mastering modern seating. The magic is in the materials—or rather, the meshing of several different ones. 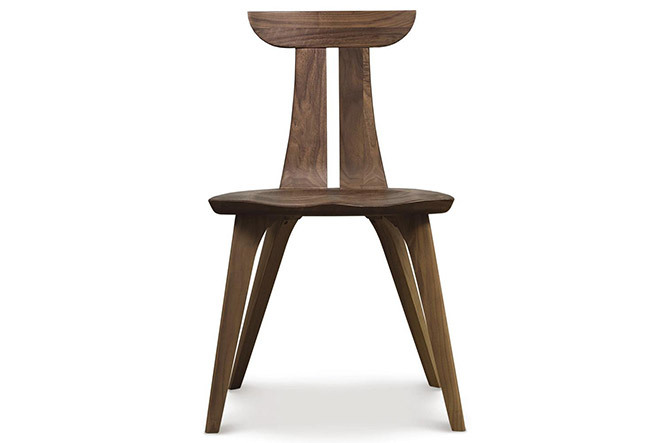 Santa & Cole’s Belloch Chair has a seat back and base made from polypropylene, paired with solid wood legs. The sturdy design was actually created for the offices of Santa & Cole in Spain, but it was received so well (and received so many requests) that it became available to the public. The stackable design embodies the philosophy that simplicity and quality materials are everything one needs in a modern chair. 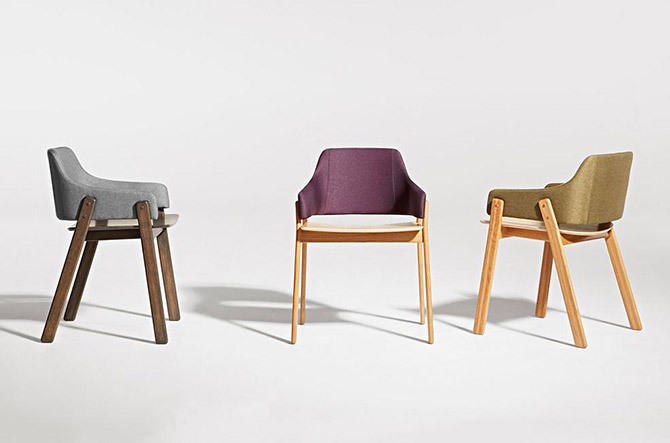 A plush upgrade to the familiar schoolhouse chair. 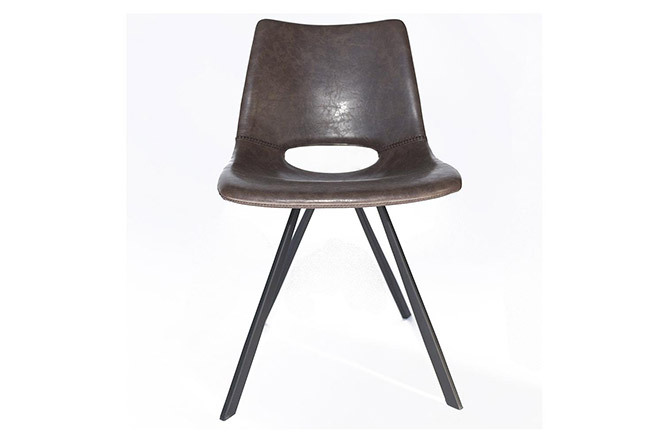 Coated in faux leather (for easy cleaning) with angular steel legs, it’s a smart blend of industrial and rustic styles that’s yours for the sitting. With its solid and sturdy legs at the foundation, the Clutch chair from Blu Dot makes its way into smooth padded upholstery on the back and arm rests. With easy-to-clean upholstery in oh-so-rich colors, these make a rich addition to a home with both modern and transitional elements. A great way to bring a touch of the outdoors in and add some fun color around the dining table. 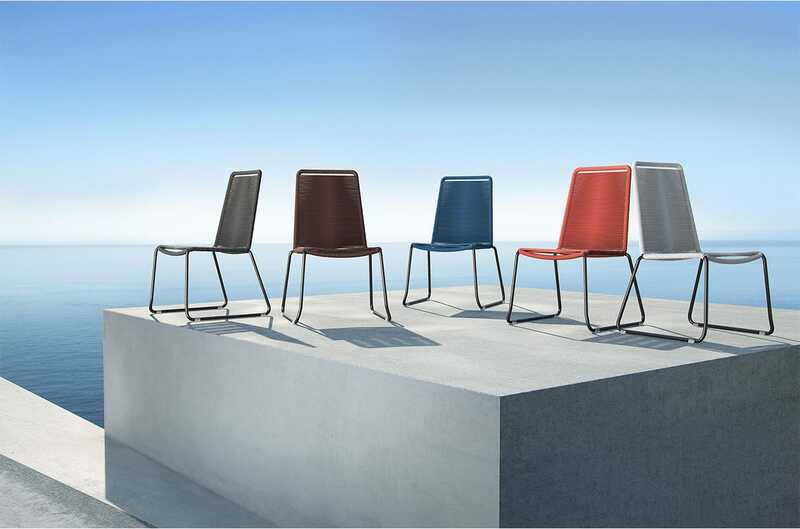 The Barclay Chair is suitable for any location, which is great because you’ll want to have it with you wherever you go. Nylon cord is woven taut over a lightweight metal wire frame and makes for an amazingly supportive, comfortable and colorful seat.